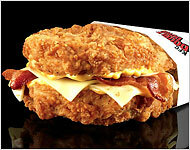 double down = double disgusting – who is eating this stuff? If you haven’t heard about the latest release from KFC, here is it. Looks like a heart attack on a plate to me. finally a restaurant that has a low carb alternative for someone whose body attaches itself to a gram of sugar like white on rice. I love it!!! No more wasting bread! !